Foam Case Inserts - Custom Foam Inserts Chicago | Foamcraft USA, LLC. Foam case inserts (also called case inlays) can be a great way to showcase a precious item while keeping it safe. Foam is the material of choice due to its unique physical properties, varieties of materials, densities and firmness', color choices and the varied method of fabrication available. Custom foam inserts for cases or foam trays can be die cut, contour cut, or compression cut. If you are packaging rounded items, compression cut foam provides a scooped out cavity that hugs and protects your items. 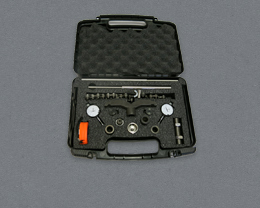 All case insert are available with convoluted foam lids or lids and bottoms. Flocked foam can be added to the top layer to give your insert vibrant color options. Foam can help enhance the interior appearance of your case. We will work with your design or offer our in-house design, engineering and prototyping to make your foam case inserts and foam trays unique and professional. We will listen ot you and provide exactly what you are looking for or suggest alternate ways to shave down costs or improve the appearance of your foam case insert to heighten your products visual appeal. To get started, request a quote today!